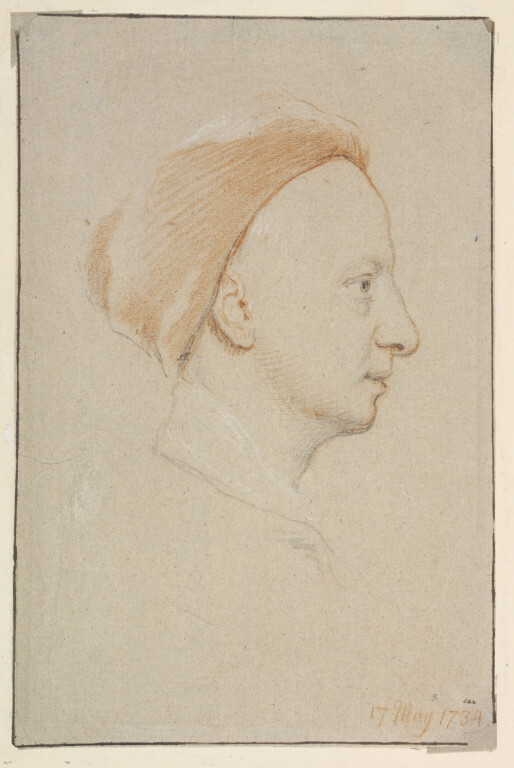 The portraitist and influential art theorist Jonathan Richardson valued drawings highly, and built a great collection of examples by old masters. After his retirement he made many portrait drawings, mostly self-portraits and portraits of his son, Jonathan Richardson the younger. This delicate profile portrait represents his son at home, wearing informal headgear. Profile, to the right, of a man in a cap, showing no hair, the chin shaven; Inscribed Young Richardson, 17 May 1734.; Drawn with red and black chalk, and heightened. Inscribed Young Richardson, 17 May 1734. 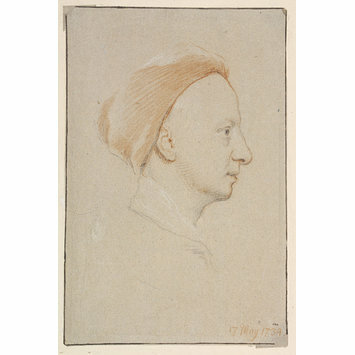 Jonathan Richardson the elder (1667-1745); Profile, to the right, of a man in a cap (his son, Jonathan Richardson the younger). Drawn with red and black chalk, and heightened; English School; 1734.